Nov. 19, 2017 5:10 p.m.
Highway 5 reopened between Hope and Merritt just before midnight on Sunday, following a series of vehicle incidents that closed the route earlier that day. According to DriveBC, the incidents took place at Snowshed Hill. RCMP confirmed that there were no serious accidents and that no one was injured but that skidding vehicles and jackknifed semis made the road impassible for several hours. 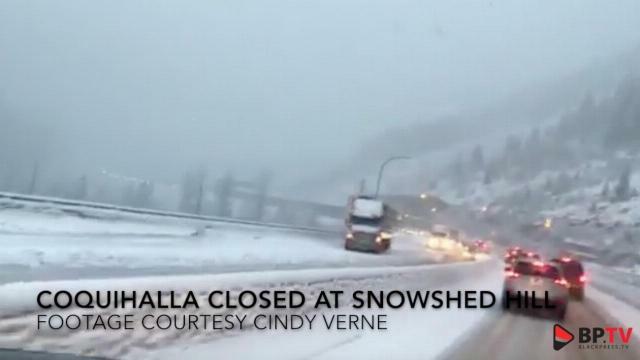 Video footage from the area showed heavy snow and heavy traffic near Snowshed Hill and commuters said that a chain-up was in effect, slowing traffic further. Another vehicle incident along Highway 5, this time between Barriere and Clearwater, has also been cleared. CLEAR – #BCHwy5 vehicle incident 29km north of #Barriere. The highway is fully open. Earlier on Sunday, Environment Canada issued a snowfall warning for the stretch of Hwy. 5 between Merritt and Hope. Another one has since been issued for Monday.